The agreement, which must still be voted on by the Senate and the House of Representatives, imposes unprecedented cuts on domestic social spending without a single dollar of increased taxes on the wealthy. The first $1 trillion will comprise spending cuts already agreed upon in bipartisan talks headed by Vice President Joseph Biden, mainly in non-entitlement domestic programs including education, housing, transportation and the environment. The immediate effect of these cuts will be substantial—$25 billion in fiscal year 2012, which begins October 1, and $47 billion in fiscal year 2013—and escalating thereafter. A new 12-member House-Senate committee, consisting of three Democrats and three Republicans from each body, will have until Thanksgiving to identify an additional $1.7 trillion to $1.8 trillion in spending cuts, including entitlement programs such as Medicare, Medicaid and Social Security. Theoretically, the committee could also mandate an end to certain tax breaks to increase government revenues, but Republican leaders are on record opposing even token tax increases on the wealthy, and Obama and the congressional Democratic leadership have dropped their previous demand that any deficit reduction package include some tax increases. 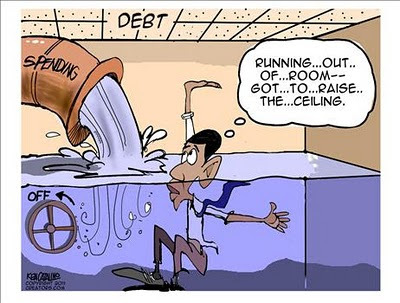 Recently there has been talk in the news to raise the current Federal Governments debt ceiling above $14.29 trillion dollars. 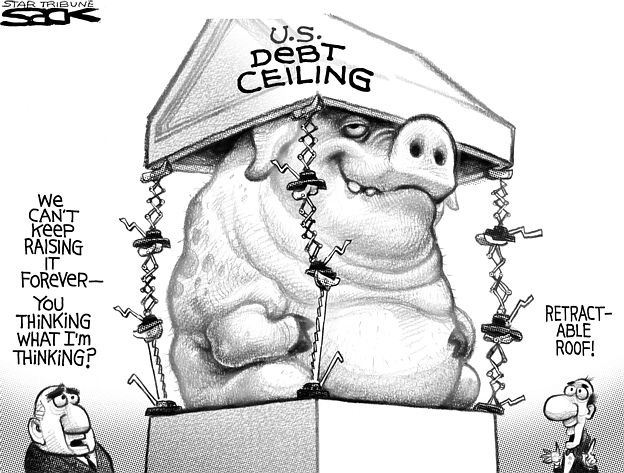 The argument is that if we don’t raise the debt ceiling the US will be forced to default on its debts. They say that they will be unable to pay their debts and if that happens the United States will lose its creditability and no one, private individuals or other nations, will loan to our government and that will cause a dollar crises. What’s the problem with this stated dilemma? First of all it very clearly implies that if we don’t go deeper into debt that we will be unable to pay our debt. Why don’t the politicians in support of raising the limit state it as clearly as that? Why it’s for the very same reason they use fraises like QE1 and QE2. If they were to directly say “We must continue borrowing in order to pay our debt on what we have already borrowed” I think then more people’s mouths would drop to the floor in total shock of the audacity. Who in the world can believe it? Imagine, you personally run yourself into debt, you then go and ask your bank for a loan to pay your debt, but you don’t just pay your debt you buy other things and give some money away. Now you find yourself even deeper in debt so you call up your credit card company and ask them to raise your credit limit. You then reach your credit limit and need to take out another loan to pay back your minimum payments. How long do you think you could continue doing this? I think YOU would get as far, in this scenario, as calling your credit card company to raise your limit before they laugh you off the phone. Well your Government has been doing this very thing for over 30 years, only no one is laughing. They say there would be a dollar crises, but in fact it’s very clear that there already is one. Our current debt is $14 trillion dollars. We are quickly reaching the ceiling of $14.29 trillion within a few months. If they haven’t been able to manage the debt by the time they reached 10 trillion what in the world would make you think they will somehow find the wisdom to manage it now? The reality is that the total real debt has already passed this limit when you include state and local debt. That takes the total debt to $16.85 trillion. The arbitrary mark has already been passed. Simply paying the interest on such a crushing debt is impossible without continued borrowing and money printing. The government is like and alcoholic or crack addict that has reached a critical point in his addiction. He needs more and more now just to stay alive and if he stops he will die. The question is, once you reach that point are you really alive? The truth is the dollar is already dead. They can shoot up a few more times but the damage has already been done. I believe that they are pushing the people to mass hysteria by this and many other tactics, 911 for example. Once the people are pushed so hard, and they begin to fight back, they will have reason for martial law. Remember many of the weapons used against the masses around the world were made in the USA. It boggles the mind that the wealthy do not want to have an increase in taxes, but would rather imposed draconian decreases in the social services needed most by the masses, who far outnumber the rich elitists. It appears to be a serious disconnect between what is happening on the ground and what is happening in their ivory towers. The wealth will not trickle down and will remain out of the reach of those who most need it. Our society is like a runaway locomotive, with no one at the helm to forestall the coming disaster. But with disasters being the driving force behind the elite’s prerequisite desire to remain elites, surely they are devising plans that will secure them in any situation, no matter how dire to the masses. They make sure they are protected by their own guards – and out of the reach of any disaster that may befall the rest of us. Unfortunately, the American citizen continues to believe that a corrupt system that started on the backs and deaths of millions of Indigenous peoples and kidnapped Africans can be changed by creating a “New Party” to jockey with the existing ones. If this happened, eventually this “New Party” too, will become corrupt. A system or mass movement that demands the governments take care of them is doomed to remain the slaves they were before the movement. That type of system is the design of slave owners for their property, the slaves. It’s all a holographic game designed to keep the populace in the Matrix of survival and submission to their overlords. It matters not what color, race or ethnicity they are. Once they have become part of the clan of destruction, they will do the exact same thing that was done to the populace throughout the history of their fore-fathers and ours. Because this miserable way of governing a people has continued for so long, and there has been no obvious cure, except for a few rebellions along the way; the cancer persists and the only solution is the complete destruction of all the cancerous cells.